Video documentation at the bottom. 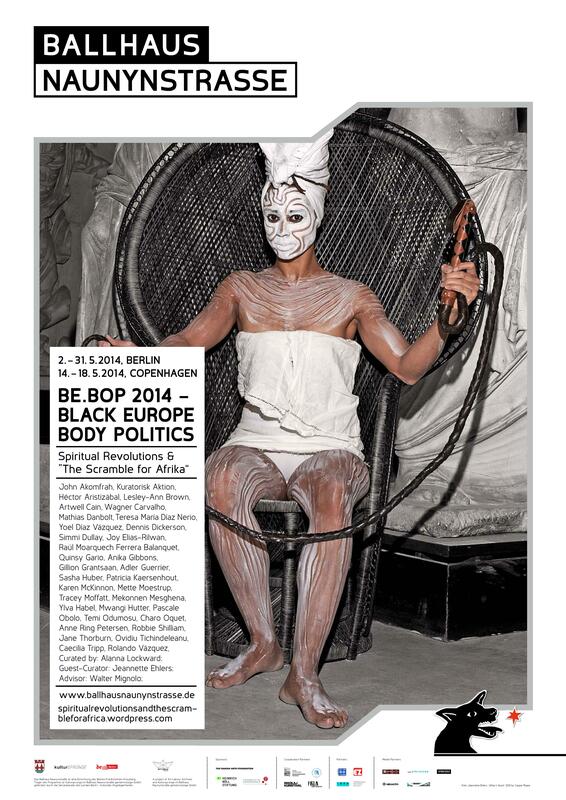 BE.BOP previous editions (2012-2013) have engaged European audiences in intricate detail with the outrage generated by Black/African Diaspora peoples when confronting a racist world order structured along the lines of coloniality. BE.BOP 2014 now brings re-existence into the hallowed grounds of healing by means of drawing the spiritual map of Pan-Africanism before and after the so-called “Scramble for Africa”. The event will include for the first time an exhibition and a simultaneous presentation in Copenhagen in connection to “Say it Loud!”, so far the largest overall presentation of Jeannette Ehlers’ videoworks at Nikolaj Kunsthal (15.03-25.05.2014). Ehlers’ video “Whip it Good”, which premiered as a performance during BE.BOP 2013, will be projected in the Foyer of Ballhaus Naunynstrasse. The self-explanatory whipping action in Ehlers’ work brings up unsolved issues regarding enslavement in the Caribbean plantation system and the challenges of coloniality. These are concerns that have been discussed thoroughly at BE.BOP since its pioneering introduction of the theoretical perspective modernity/coloniality/decoloniality conceptualized by a group of thinkers and activists from the Americas, the Caribbean and the US Latino Diaspora in the 90’s. In his keynote entitled “Spirituality, Subjectivity And (Im) Migrant Consciousness: The Tasks Ahead”, Walter Mignolo, one of the founders of this group and advisor of BE.BOP, will address how the combination of these entanglements has created the conditions for reversing migration movements: from the colonies and ex-colonies to Europe and the US. Another extraordinary public lecture will be given by Dennis Dickerson with the title “Religious Insurgency and the Long Civil Rights Movement in the United States.” in the framekwork of the Du Bois Lectures organized by the English and American Studies Department, Humboldt University Berlin. For the first time in Berlin, Héctor Aristizábal, an internationally known theater of the oppressed practitioner, will create a space for collective meditation after his 30 minutes performance “Nightwind”. Also premiering in Berlin, the moving-image work of Anika Gibbons, Sasha Huber, Joy Elias Rilwan and Jane Thorburn will be presented along the photo series “Platos para los Muertos” (Meals for the Dead) by Yoel Díaz Vázquez dedicated to the Orishas. The exhibition will open with “Poison”, a performance by Charo Oquet , who will involve the audience with her characteristic usage of colour and video projections as healing devices, opening the way to an unprecedented meeting which in the liberating tradition of performance art is free and open to the public. In the compilation of moving image from previous editions with groundbreaking works by Adler Guerrier,Teresa María Díaz Nerio, Raúl Moarquech Ferrera Balanquet, Mwangi Hutter, Tracey Moffatt, Pascale Obolo and Caecilia Tripp, among others, the public will be able to appreciate how BE.BOP. BLACK EUROPE BODY POLITICS continues its contribution to the radical imagination of European futures in which immigrants are becoming fundamental players. The event takes place in English. Free and open to the public. BE.BOP previous editions (2012-2013) have engaged European audiences in intricate detail with the outrage generated by Black/African Diaspora peoples when confronting a racist world order structured along the lines of coloniality. BE.BOP 2014 now brings re-existence into the hallowed grounds of healing by means of drawing the spiritual map of Pan-Africanism before and after the so-called “Scramble for Africa”. 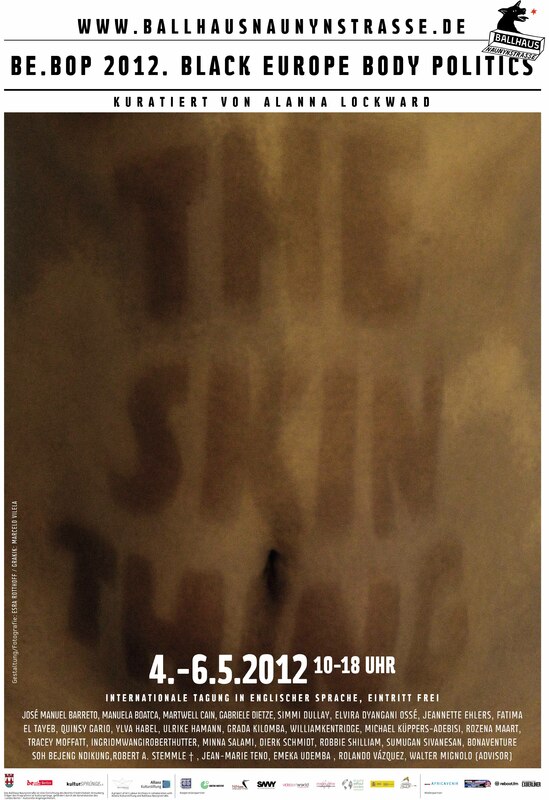 The event will include for the first time an exhibition and a simultaneous presentation in Copenhagen in connection to “Say it Loud!”, Jeannette Ehlers’ first anthological exhibition at Nikolaj Kunsthal (15.03-25.05.2014). The event takes place in English. Free and open to the public, except the screening of John Akomfrah’s film. After its outstanding debut last year, this second edition of the series BLACK EUROPE BODY POLITICS was expanded with live performances and an all-day screening commemorating Malcolm X´s birthday at the Hackesche Höfe Kino, in cooperation with AfricAvenir. DECOLONIZING THE “COLD” WAR is the first Afropean performance showcase and was accompanied by roundtable discussions on the aesthetic legacy of the Black Power movement in the radical imagination of Diaspora artists. Parallel to this, its influence in liberation and decolonization struggles in the Global South during the so-called “Cold” War was approached from the continuities of coloniality. According to Enrique Dussel, a liberation philosopher and decolonial thinker, this war was never “cold” in the Global South. During this festival, the story was told from the perspective of the self-affirmation of Black Power. The emblematic figure of Angela Davis created a planetary movement of solidarity that went beyond the term “Black Internationalism”. These narratives of re-existence were analyzed in relation to Frantz Fanon´s fundamental role in global South liberation struggles during that period. His interactions with Jean-Paul Sartre were the focus of some of these unprecedented debates. The worldwide solidarities resulting from the Black Power movement united people beyond racialization and political agendas. BE.BOP 2013 celebrated a paradigm shift that transformed the Black Body into a source of inspiration and beauty prevalent until today. BE.BOP 2012- BLACK EUROPE BODY POLITICS was the first international screening program and transdisciplinary roundtable centered on Black European citizenship in connection to recent moving image and performative practices. It was inaugurated at Ballhaus Naunynstrasse, a translocal theatre space which serves as point of arrival for artists from (post) migrant communities and beyond, founded in 2008 by Shermin Langhoff with the support of Fatih Akin. The framework of this meeting was circumscribed within decolonial theories which expose how the idea of citizenship is linked to current racializing configurations and hence with the limits of humanity. In that sense, the racial hierarchy of human existence, originating in the Renaissance and prescribed legally during the Enlightenment, established current (white-male-heteronormative-Christian-Western) European notions of who is Human and who is lower in that hierarchy, thereby designating citizenship, one of the most important legacies of modernity. The time-based positions discussed at this meeting were selected because they contest (racializing) fantasies on European citizenship. By means of analyzing these narratives of re-existence, BE.BOP 2012 aimed at facilitating a long-term exchange between specialists in disciplines unrelated to visual arts and time-based art practitioners of different contexts of the Black European Diaspora. It successfully created multiple dialogues across the fields of history, legal studies, theatre, art and political activism. This meeting was motivated and theoretically embedded to Decolonial Aesthetics and more specifically to Decolonial Diasporic Aesthetics, a term coined by curator, Alanna Lockward. In the spirit of the transformative and liberating qualities of performance art, this event was free and open to the public. BE.BOP 2013. DECOLONIZING THE “COLD” WAR. All videos edited and uploaded by Elena Quintarelli. DECOLONIZING AFROPEAN CITIZENSHIP: WRIGHT, BIKO, FANON AND SARTRE. Artwell Cain. “‘The (Mis) representation of the Black in the Netherlands”. Alanna Lockward. “Black Europe Body Politics. Towards an Afropean Decolonial Aesthetics”. Walter Mignolo. “Decolonization of the ‘Cold’ War started with the Bandung Conference, 1955”. Robbie Shilliam. “Colonial Amnesia and the Crisis of Europe”. THE BLACK BODY IN THE EAST. BLACK POWER IN FORMER EASTERN EUROPE AND BEYOND. Moritz Ege. “Afroamericanophilia. Popular Culture and the West German ‘New Left’. Adetoun Küppers Adebisi. “Fela and the Black Power Movement”. Dannys Montes de Oca. “Ghosts in Scene”. DECOLONIZING THE “COLD” WAR: INTERNATIONALISM, BLACK EUROPE AND THE PANTHERS I.
Neil Kenlock + Barbara Gray. “The Black Power Movement in Britain”. 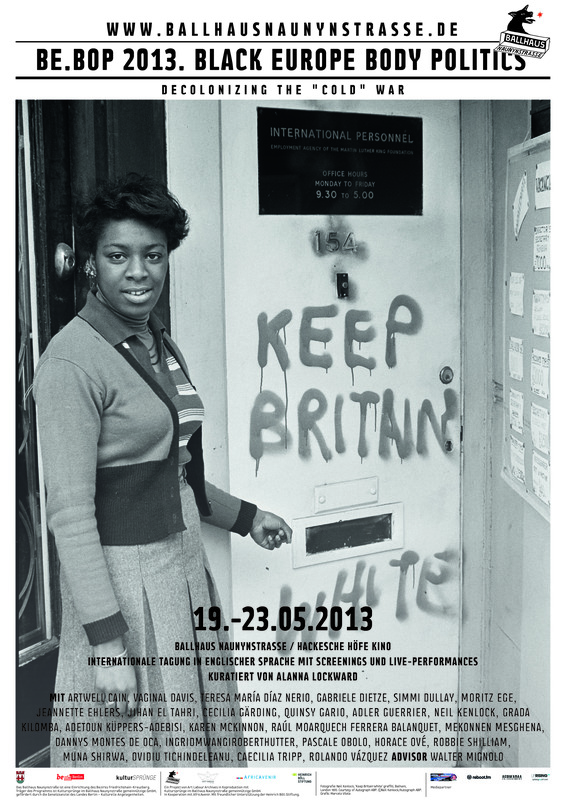 DECOLONIZING THE “COLD” WAR: INTERNATIONALISM, BLACK EUROPE AND THE PANTHERS II. Teresa María Díaz Nerio. “Hommage à Sara Bartman“. Raúl Moarquech Ferrera Balanquet. “Mariposa Ancestral Memory”. Quinsy Gario & Muna Shirwa. “Canned Goat”. Jeannette Ehlers. “Whip it Good”. Artwell Cain (Netherlands+St. Vincent) + Vaginal Davis (Germany+USA) + Teresa María Díaz Nerio (Netherlands+Dominican Republic) + Simmi Dullay (South Africa+Denmark) + Moritz Ege (Germany) + Jeannette Ehlers (Denmark+Trinidad) + Jihan El Tahri (Egypt+South Africa+France) + Cecilia Gärding (Sweden+South Africa) + Quinsy Gario (Netherlands+Curazao) + Barbara Gray (England+Jamica) + Adler Guerrier (USA+Haiti) + Neil Kenlock (England + Jamaica) + Grada Kilomba (Germany+São Tomé e Principe+Portugal) + Adetoun Küppers-Adebisi (Germany+Nigeria) + Raúl Moarquech Ferrera Balanquet (Cuba+Mexico+USA) + Karen McKinnon (England + USA) + Mekonnen Mesghena (Germany + Eritrea) + Dannys Montes de Oca (Cuba) + Ingrid Mwangi Robert Hutter (Germany+Kenya) + Pascale Obolo (France+Cameroon) + Horace Ové (England+Trinidad) + Robbie Shilliam (England) + Ovidiu Tichindeleanu (Rumania) + Caecilia Tripp (France+Germany) + Rolando Vázquez (Netherlands+Mexico).